Yes the Bandh call has given a mixed response, but the 100% response is seen in the market place where the people are scarce in number than everyday. All the business men are all using this time to wash and clean their shops for diwali. 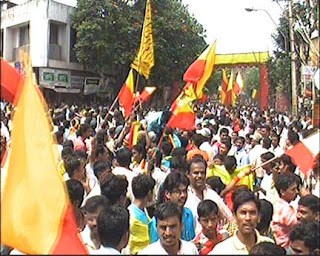 The picture is from Katives area where the procession of the Rajostav celebrations is going on. You can see the youth dancing on Kannada songs. Marathis are unnecessarily creating nuisance over blogs and orkut about this belgaum issue.